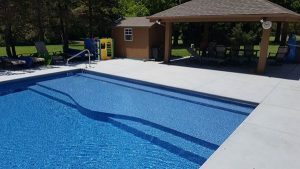 Sundecks are not just for concrete pools any more they can now be installed on select vinyl pools. 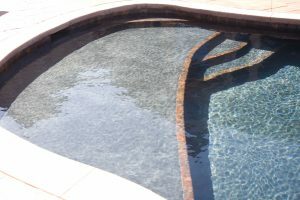 They offer a nice big area to relax in the pool without completely submerging in the water. Perfect for small kids who just want to splash around in a couple inches of water. Vinyl liner safe loungers can be placed to create the perfect sun bathing atmosphere. Trend Alert: Sun umbrellas can be anchored in concrete sundecks to provide a shaded area.